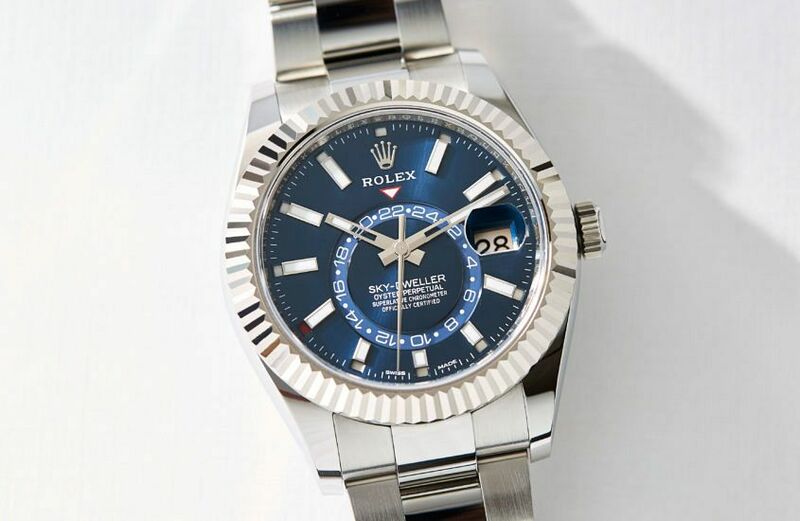 For years, the Sky-Dweller has been one of the most interesting and least understood modern Rolexes. 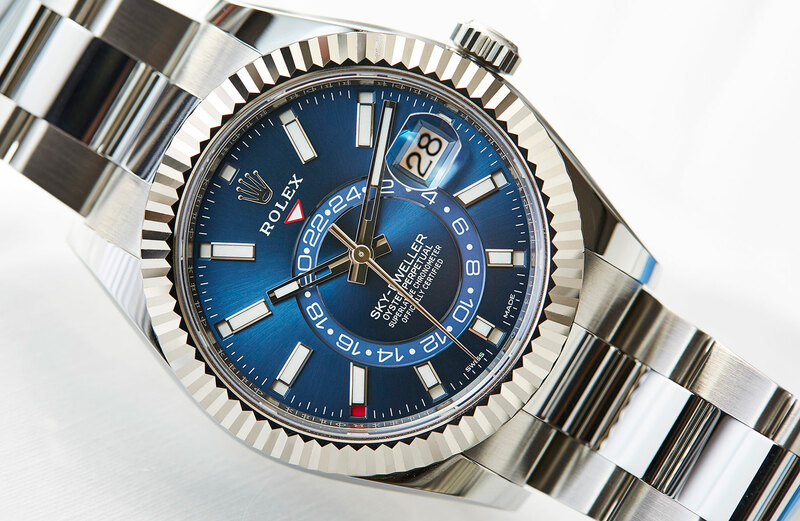 It’s one of the most complicated watches in their lineup, as a luxury traveller’s watch, and is the patrician elder brother of the tool-like GMT-Master II. This niche proposition, along with its solid gold offering, always made it something of an outsider Rolex. Until now. 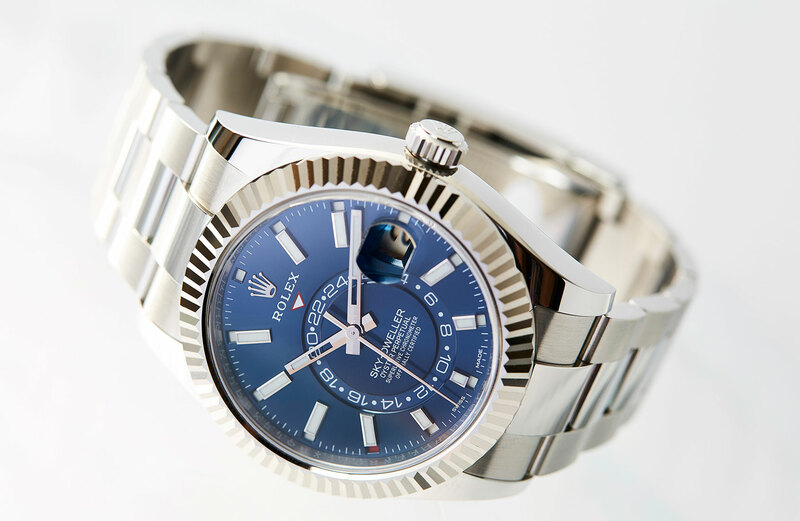 In some ways the case of the Sky-Dweller remains identical to the version released in 2012, but viewed a different way, the changes to the big 42mm case represent the single biggest shift to the model, which has seen it rocket to the top of many a fan’s list. It’s all about the material. For the first five years of its life, the Sky-Dweller existed only in precious metals: white, yellow or Everose gold. 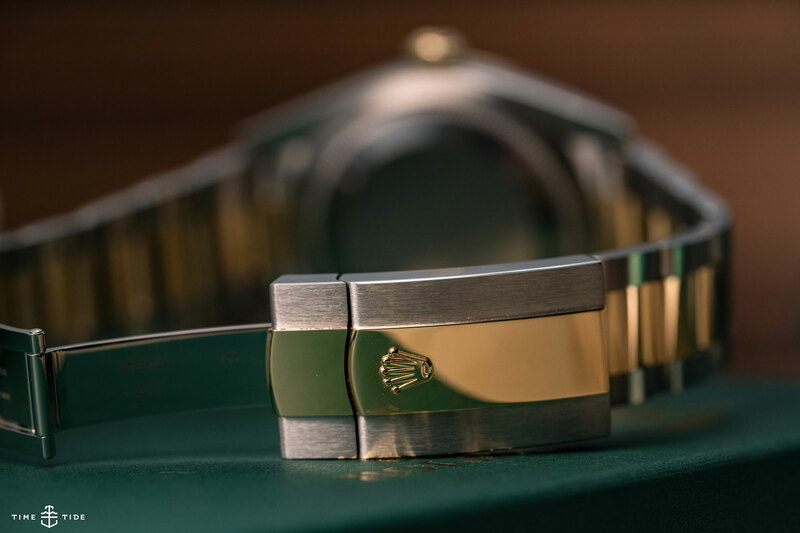 Not only did this place the watch into a premium price bracket, but it was also every inch the solid gold Rolex — unavoidably so with that large, fluted bezel. But, as Baselworld 2017 rolled around and the Rolesor Sky-Dwellers were unveiled, the proposition suddenly changed. Fifty grand plus suddenly came down to around twenty, bringing the Sky-Dweller within reach of a whole lot more people. 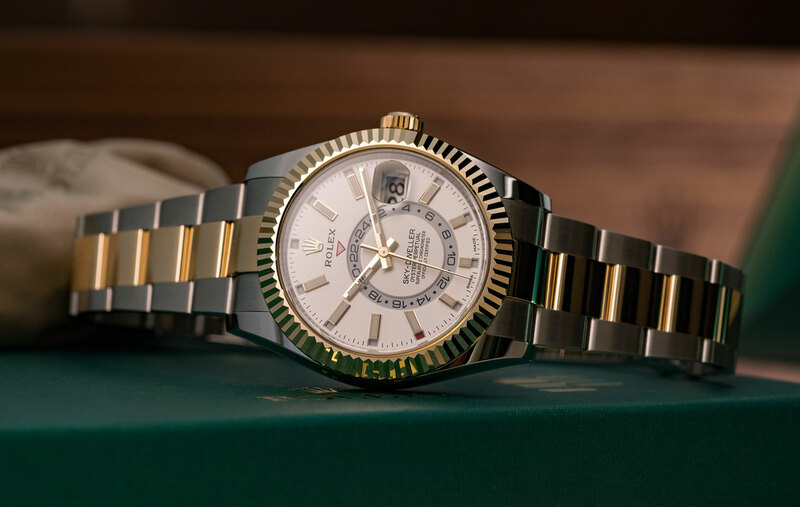 Rolex released two Rolesor versions — yellow gold with a precious bezel and centre bracelet links, or a white gold option where only the bezel is made from the precious metal. 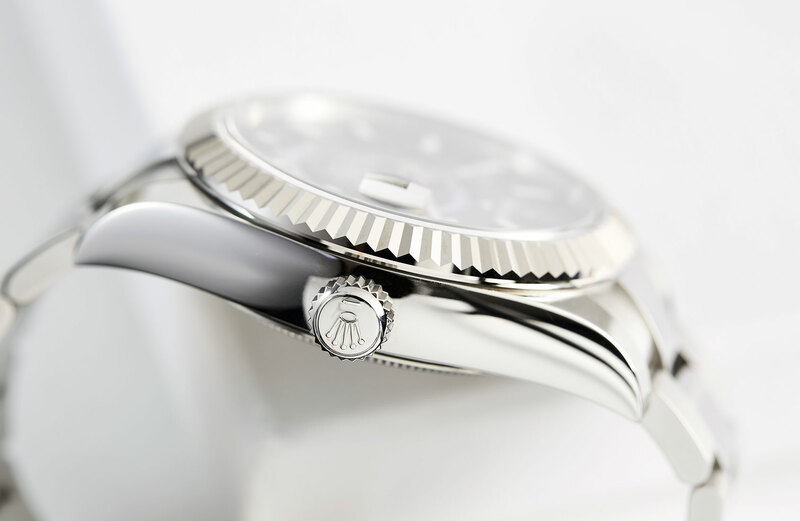 Aside from the case, the other major change to the Sky-Dweller is the design of the dial. And not just that stellar starburst blue option. Gone are the radial Arabic or Roman numerals, replaced with elongated applied batons, filled with Chromalight. This one change makes a huge difference to the simplicity of the dial. That and the fact that the second time zone disc is now colour matched to the dial rather than contrasting. Aside from these cosmetic upgrades, the Sky-Dweller’s dial is still the same legible design that smartly packs a lot of information into a small space. The most obvious feature is the second time zone, displayed via an off-centre 24-hour display. There’s also a dual calendar, with the date displayed under the traditional Cyclops and the month subtly indicated by a red marker at the outer edge of the hour markers. Every time I see this month implementation, I’m beguiled by its simplicity, and it still confounds me that it’s not a more popular style of calendar (Rolex is the only volume brand who use it, to my knowledge). 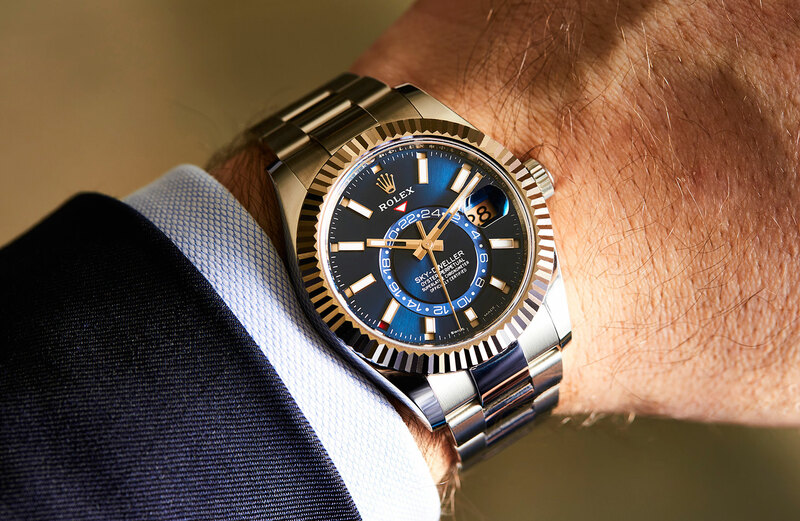 It might be too much to say that this simplified, somewhat sportier dial is an improvement on the dial of the all-gold model, as that watch has a different personality to the Rolesor. But I am quite confident in saying that this new dial will appeal to a wider audience. Extra points for the cutouts on the hands so as to always allow maximum legibility of the home time dial. 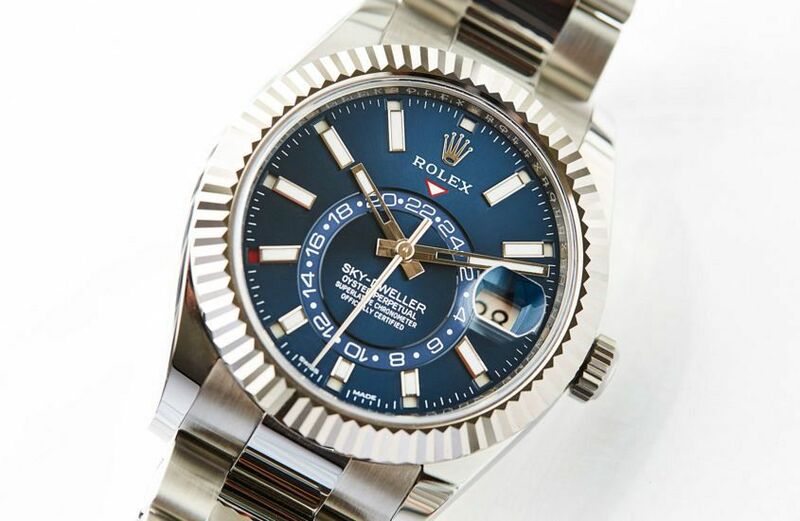 The most impressive part of the Sky-Dweller is the movement. Not just because the Calibre 9001 is a highly complicated, modern movement with a mighty 72 hours of power reserve and protected by seven patents. No, it stands out because of how you interact with the various functions. You see that pretty fluted gold bezel? That’s not a regular bezel, it’s actually quite an ingenious piece of user-friendly engineering called the Ring Command. Twist it to the left and you’ll notice it has three distinct positions. Change the position of this bezel, and the crown changes a different complication. The third position (hard left) allows you to change the home time, the second position changes local time, and the first position allows you to change the annual calendar. It’s an innovative, over-engineered and user-friendly solution to a problem you never knew you had. Just the sort of innovation that Rolex excels at. The large case size and that light-flinging fluted bezel make the Sky-Dweller an attention drawing watch, and the fact that it’s not solid gold only reduces the bling-factor so much, but honestly, you’ve just got to embrace it. Aside from that it’s the typical flawless Rolex experience. 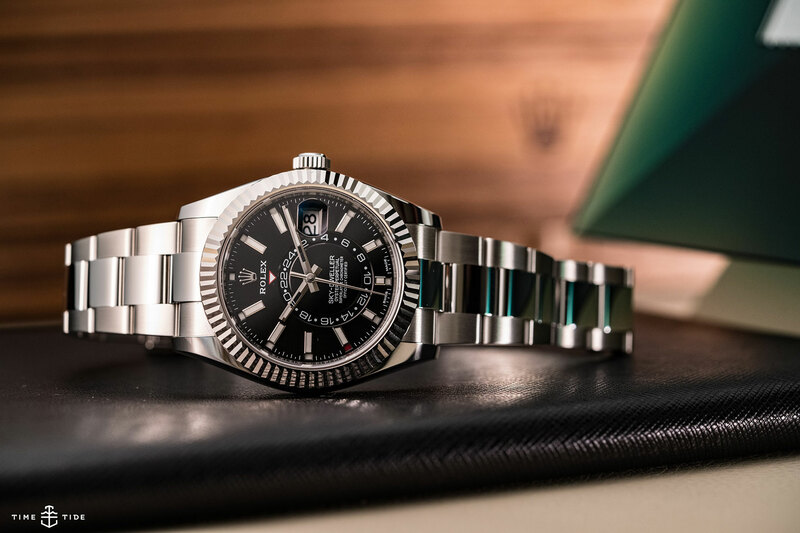 The Sky-Dweller has always been a great watch, and now, with its smartly redesigned dial and more accessible case material, it’s just a little bit greater. 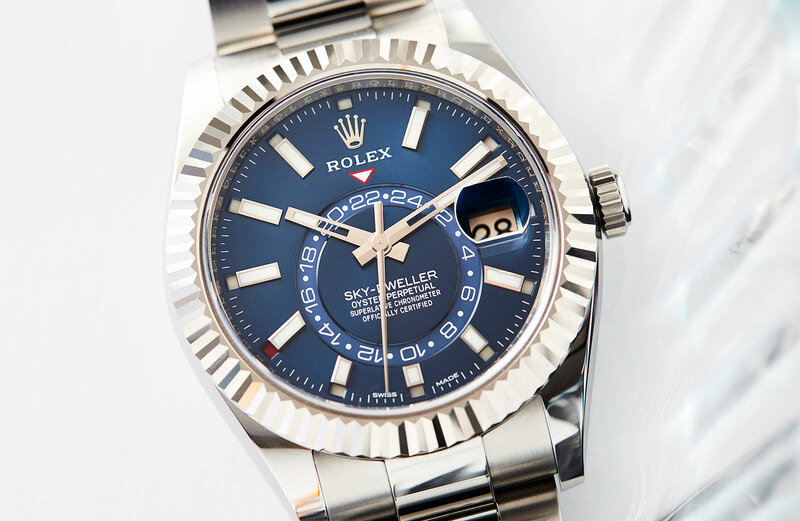 There’s no doubt that the Sky-Dweller is one of 2017’s ‘it’ Rolexes, along with the Sea-Dweller. But if you prefer brains over brawn, the Sky-Dweller might just be the one for you. Watches like this always make me regret including the “what would we change” part of the review. Everything here is so considered and so thought through that there’s really not much to say. However, I included it, so there’s no getting around it. If it were up to me I’d love it in a slightly smaller case. Failing that, a bezel that’s a tad less extravagantly fluted would be right up my alley. Images by Jason Reekie and Marcus Flack.